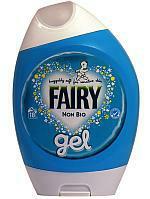 Fairy has launched a non bio laundry gel in a squeezable bottle. The thick gel has been designed to prevent people using too much, and the cap of the bottle acts as a means of measuring dosage, and can be placed in the washing machine’s drum along with the laundry. The gel is likely to cost £4.89 for an 18 wash bottle (667ml), and £6.69 for a 26 wash bottle (962ml). Fairy Non Bio Gel is made by Proctor and Gamble, which also makes Ariel Excel Gel, which was a runaway Best Buy in our recent . Ariel has now released a non bio version of the Excel Gel, which, like the regular Ariel Excel, is designed to clean well at washing temperatures as low as 15°C. In our tests, Ariel Excel Gel performed very well when we tested it at 30°C. There are very few washing machines on the market that can wash laundry at temperatures as low as 15°C. Find out more about Ariel’s Excel Gel in our , and for help finding the best washing machines and the best tumble dryers, read our washing machine reviews and our , where you’ll find full test results of almost 300 models. For help finding the best deals on washing machines, and bargain tumble driers, visit Which? Compare – our free price-comparison website. For daily consumer news, subscribe to the here. If you have an older web browser you may need to copy and paste this link into your newsreader: https://www.which.co.uk/feeds/reviews/news.xml . Find out more about RSS in the Which? guide to news feeds.